Another unbelievably cold morning up above the treeline today – Jasper had left his socks out overnight and by the morning they were covered in frost. Fortunately the hut itself was all right, though pretty much the same temperature as outside just without the wind, and the valley was situated such that by the time we woke up the sun was already reaching us and warming the air. It was one of the most beautiful mornings so far, in open high steep country and not a cloud in the sky. 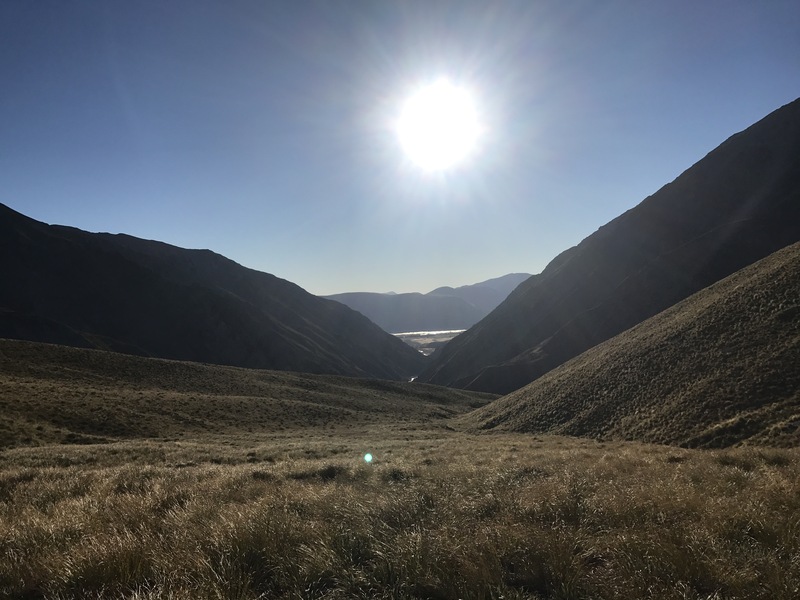 We were surrounded on three sides by ridges and one side by the deep Bush Stream valley with views all the way down to the Rangitata. Opposite the valley was the trail, up a wide slope towards a 1500 meter saddle around a corner. At 8 we left and after confusing the path to the stream with the track up the slope, we were on our way up. It was such a steady climb to the saddle, about 2.5 km and 500 meters of elevation at a pretty constant grade, that we felt pretty great all the way up. About a quarter of a kilometer below the saddle we crossed over into the cold morning shade, so when we arrived at the top we were not immediately rewarded by warm sun, but we scrambled up no more than 20 vertical meters up the right side of the saddle to where the sun was already at work, and about 15 minutes later while we sat and snacked it had worked its way all the way down to the bottom of the saddle. During our break Shepard clambered further up the slope, and spent some time on top of the peak and reported that the views were amazing. Something interesting we noticed while we were sitting was that as the sun warmed the ground, the miniature ice structures holding together the pebbles would melt and the rocks would fall down an inch or so with a little pop, and they looked like hopping insects surrounding us. 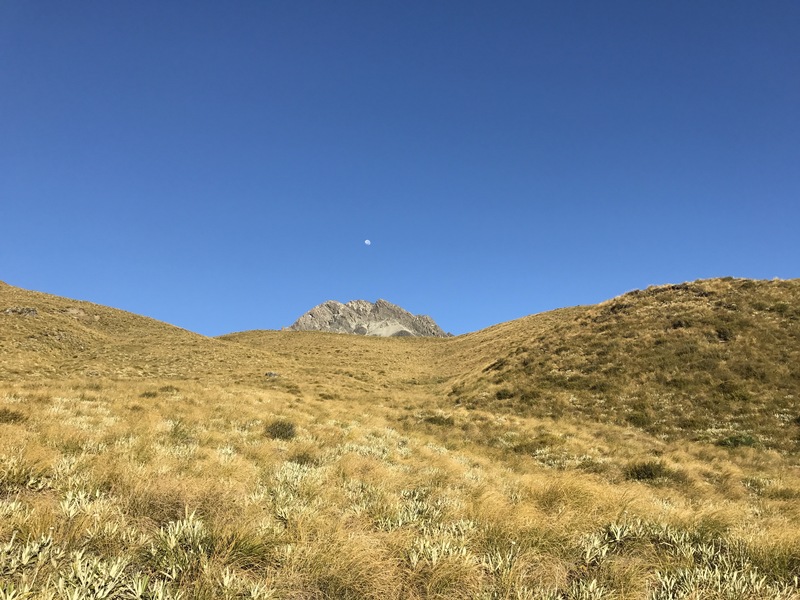 Once Shepard returned we made our way down the valley for 6 km, losing and finding the trail quite often due to the huge distance between poles, and took until about 11:30 of smooth-ish up and down hiking in tussocky hills to rejoin Bush Stream at Stone Hut. Just before the reunion with Bush Stream the trail comes out overlooking the valley and an old stock bridge that leads across to the hut. Up here there is no more bush surrounding the stream and the banks are quite rocky and bluffy. Stone hut is so named because a wall and chimney of it are made from stones that look to be from the directly surrounding area. As we approached the hut a kiwi couple was packing up to leave for the day, and we were glad to spread out inside the hut to get out of the sun and have a super relaxed lunch. We ate for an hour and half while our shoes and such dried in the hot sun outside. After lunch we continued and immediately the trail crossed the stream – most of us surrendered ourselves to a wet crossing upon first sight of the ford but shepard was feeling plucky and made some huge leaps to get across on the tops of rocks, but tragically slipped on the very last rock and got his high top Gore-Tex boots wet. 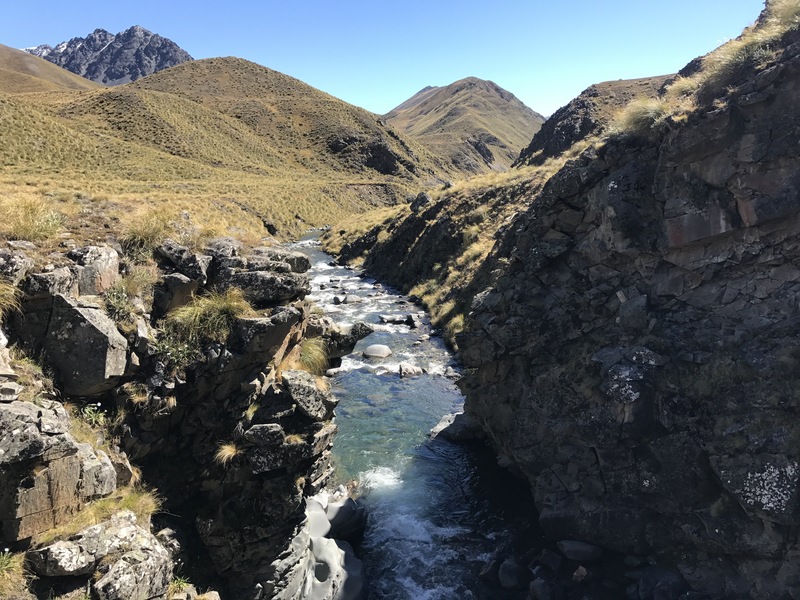 We followed the stream up its valley for the rest of the day, crossing back and forth multiple times to avoid bluffs and such; it was just five and a half kilometers and one and half hours after lunch when we pulled into Royal Hut. It was a day of pretty easy walking, all told, but by mid-afternoon it was blazing hot and we were so glad to be done and out of the sun. Royal Hut is very nice for what it is, a classic musterers’ hut that was used by workers on Mesopotamia Station who would have to round up all the sheep up in the mountains a couple times every year. On the tin walls and door there are lists of names and dates of musters going back to the early 1900s. Inside it’s somehow both cozy and roomy and though it’s quite exposed it’s calm inside. It’s in the middle of a beautiful huge yellow valley, and we can almost see Stag Saddle around the corner to the West. 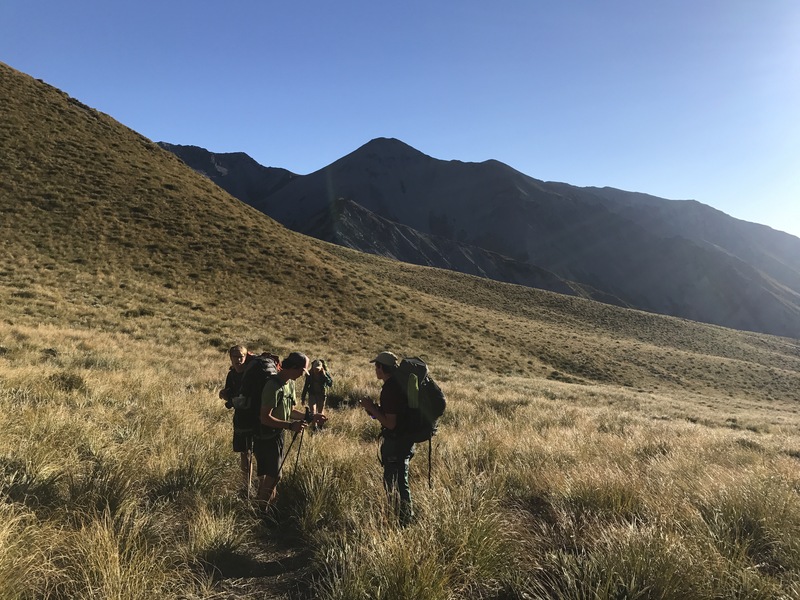 As we chilled and played cards a group of old ladies gradually trickled in, some kiwis on an expedition over stag saddle the next day and eventually down to Twizel, following the TA guided by a younger friend who hiked the South Island section last summer. Upon hearing that four 70-year-olds were among those arriving we decided we’d be setting up tents rather than occupying six of the eight bunks inside. 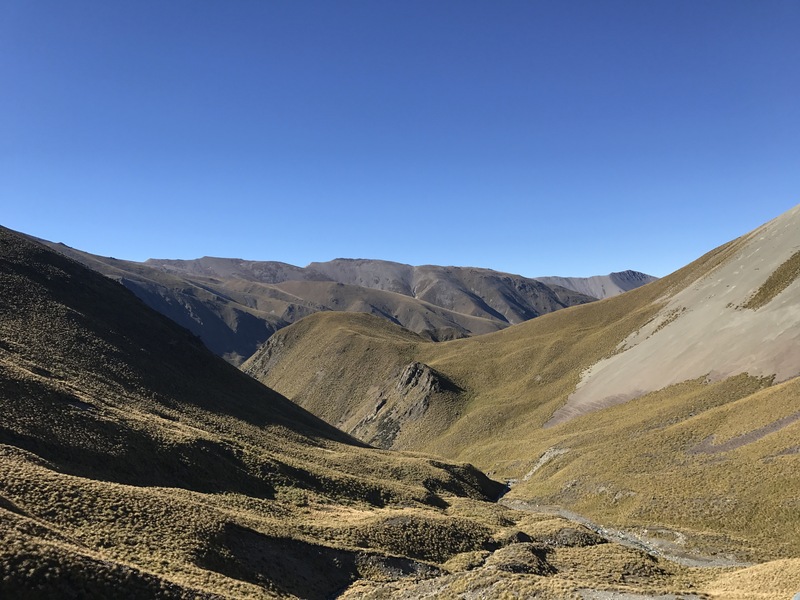 After we set up camp outside, there was much snacking and a cheesy cous cous dinner over the course of the night, and the two Austrians Sam and Julia reached the hut as did James the kiwi who arrived at 11:30 pm last night at Crooked Spur and two other unidentified trampers. We’re all tenting except for the gaggle of ladies and most are behind the hut, on the up-valley side, to avoid potential wind tonight which seems like it would mostly come up the valley. Even if it’s not windy it will be quite cold tonight so we are getting mentally ready for that. When the sun dipped behind the ridge above us it confirmed our temperature predictions and now by 7:45 we are in bags and preparing for a chilly sleep. We’re getting up probably pretty late tomorrow because we know how cold it will be in the early morning, and because we don’t really have that far to go, just to the next Hut, Camp Stream. 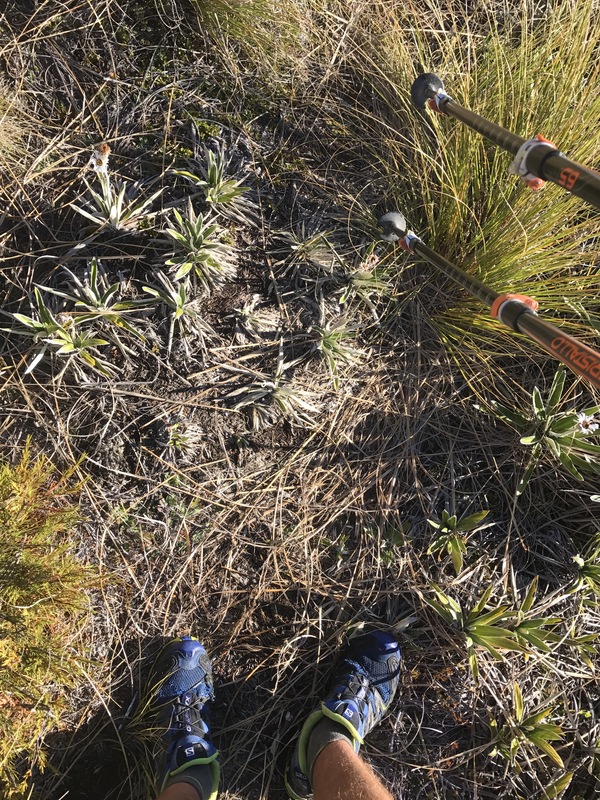 We’ll also want to take our time on top of the saddle which is only an hour or two after starting the day, and we don’t want that to be too cold to relax and eat gummies and enjoy the highest point on the whole trail. It’s still pretty light outside but we’re going to bed, hoping for weather tomorrow as clear as it was today, so that maybe we can walk down the alternate ridge route after the saddle, which is highly recommended with views across Lake Tekapo to Mt. Cook etc.! Updates coming this weekend sorry for the big gap! What a continual disappointment that this blog which promised so much has been abandoned. Hey Grant sorry for the lapses in updates. We really appreciate you following the trip, and we’re adding updates now.